The Rays struck an interesting balance between keeping their payroll in check and adding young talent, while also making some significant additions that point towards postseason hopes in 2017. The Rays’ offseason began with a pair of notable front office promotions. Erik Neander and Chaim Bloom were both made senior VPs of baseball operations, while Neander was also named general manager. President of baseball ops Matt Silverman remained atop the decision-making pyramid, this time in more of a big-picture role while Neander and Bloom focused on day-to-day operations. This “three-headed” front office structure is a little uncommon, yet it is perhaps fitting for a team that has to be able to move in several different directions at the same time. The Rays entered the winter, in fact, prepared to be either buyers or sellers depending on how they dealt with all of the trade interest in their rotation. If a rival club made an offer big enough to pry Chris Archer or Jake Odorizzi loose, Tampa Bay would look to rebuild after losing a cornerstone pitcher. If a somewhat lesser arm like Drew Smyly or Alex Cobb was dealt, however, the Rays would instead reload for another run back to contention in 2017. After several weeks of rumors surrounding the four Rays starters, Smyly ended up being the odd man out, going to the Mariners for a three-player package headlined by Mallex Smith. The 23-year-old Smith is still a work in progress at the plate, though he displayed outstanding speed and defense during his 2016 rookie season with the Braves. Smith is also under team control for at least five years, whereas Smyly is a free agent after 2018 and was getting expensive ($6.85MM in 2017) in his arbitration years. It should be noted that the Rays signed Wilson Ramos well before moving Smyly, though it could be that Ramos’ situation presented such a unique opportunity (and Tampa Bay’s long-standing need at catcher was so dire) that the team would’ve made the move whether it was rebuilding or not. The Rays made catcher a priority this winter, looking into such names as Jason Castro and Welington Castillo before finally landing Ramos on a two-year, $12.5MM deal. The idea of Ramos signing with the Rays would’ve been far-fetched six months ago, when the catcher was enjoying a big season with the Nationals and well on his way to a big payday in free agent. Disaster struck, however, when Ramos tore his ACL and meniscus in the final week of the regular season. The subsequent surgery will keep Ramos out of action until May or June, and this health uncertainty allowed Tampa Bay to get into the bidding. Assuming Ramos is able to get back on the field and look like his old self, this could end up being a win-win for both sides — Ramos gets some security now and he’ll still be only 31 when he hits the open market again, while the Rays can potentially get an All-Star backstop at a bargain price. Since Ramos will miss some action and require a good deal of DH time when he does return, Tampa was still active on the catcher front, landing Jesus Sucre in yet another trade with Seattle and also exploring such bigger-name options as Matt Wieters before Wieters signed with the Nationals. That Wieters signing led to the Nats releasing Derek Norris, which in turn allowed the Rays to then land Norris on a one-year, $1.2MM deal. Norris is an excellent pitch framer who brings more hitting upside than any of Sucre, Curt Casali, or Luke Maile, and the Rays could now shop one or more of that trio to other teams in need of help behind the plate. Ramos’ eventual role as a part-time DH also added an interesting dynamic to the Rays’ search for help at first base, left field and designated hitter. The rather slow market for free agent hitters allowed the Rays to at least explore several notable names (i.e. Jose Bautista, Mike Napoli, Wieters) that seemed far too expensive for Tampa Bay’s payroll limitations at the start of the winter. As it turned out, the Rays stuck with inexpensive options and signed Colby Rasmus and familiar face Logan Morrison to one-year contracts. Rasmus can provide cover at all three outfield positions, though his best position is in left, where he was quietly one of the game’s best defenders in 2016 with the Astros. Morrison is at best a platoon option at first base, and it wouldn’t be surprising to see Brad Miller shifted back to first from second base as the season goes on. Veteran Rickie Weeks is in camp on hand as potential platoon partner for Morrison, with switch-hitting Nick Franklin in the mix (though Franklin is better against righty pitching) and intriguing rookie Jake Bauers lurking down at Triple-A. Turning to the bullpen, the Rays signed former Rangers closer Shawn Tolleson to a one-year contract with Tolleson looking to bounce back after a very rough season. Waiver claim Jumbo Diaz and minor league signing Tommy Hunter round out Tampa Bay’s most notable relief additions. The pen will take an early hit since Brad Boxberger will begin the season on the DL with a lat injury, though the Rays look to have a pretty solid relief corps behind breakout closer Alex Colome (who drew quite a bit of trade buzz this winter). The Rays also locked down center field for years to come by signing Kevin Kiermaier to a six-year, $53.5MM extension. The two-time Gold Glove winner has been an above-average run creator in two of his three seasons and he made great strides with his plate patience in 2016. If Kiermaier can augment his excellent baserunning and otherworldly defense with more consistent hitting, it isn’t a stretch to say that he’ll become one of the game’s most valuable assets — even without much batting production, Kiermaier still generated 13.1 fWAR over the last three seasons. Logan Forsythe drew some trade attention from the Dodgers early in the spring as Los Angeles explored several fronts for a second base upgrade, though given how the Rays seemed to be building towards contending in 2017, it was still rather surprising that Tampa dealt Forsythe to L.A. for prospect Jose De Leon in late January. Evan Longoria, quite notably, vocalized his displeasure that the Rays traded a player who had developed into a valuable contributor for Tampa in 2015-16. Forsythe’s departure leaves the team without a solid second baseman and a right-handed bat within an increasingly left-handed regular lineup. Miller has struggled to find a defensive niche anywhere he has played around the diamond, so while one perhaps can’t judge him based on only 196 1/3 career innings at the keystone, assuming he can provide even passable defense as a second baseman is questionable. Miller’s move to first base also seemed to unlock his bat last year, so taking on a more challenging defensive position this year could result in a step backwards at the plate. 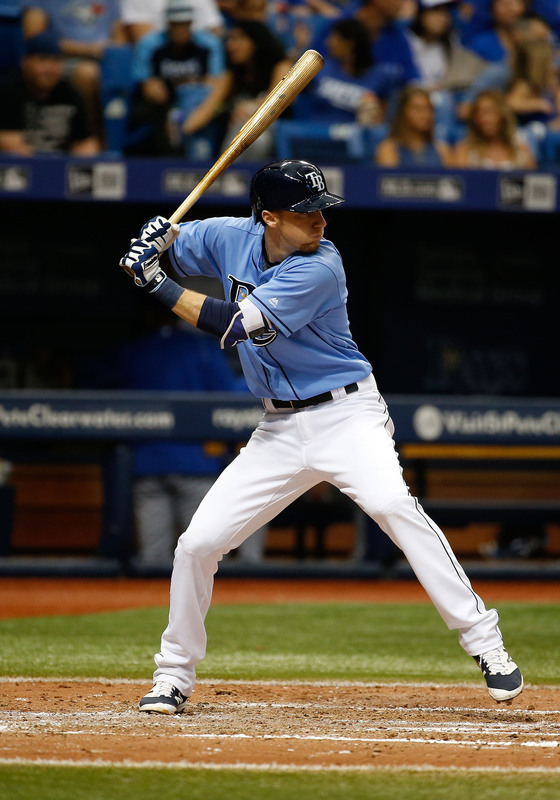 The Rays’ plan to have Miller, Franklin, and Tim Beckham handling second base took a hit due to the ongoing uncertainty about Matt Duffy’s health. Duffy has yet to even begin running drills, let alone take the field, in the wake of September surgery on the Achilles tendon in his left heel. Beckham is now penciled in as the starting shortstop, which both thins things out at second and also makes short a question mark, given Beckham’s lack of production over his career. This lack of middle infield depth has led to Roster Resource projecting former top-100 prospect Daniel Robertson to break camp with the Rays. Diamondbacks shortstop Nick Ahmed is also on the radar as a trade target, which would be a big defensive boost even if Ahmed is a weak hitter. It wouldn’t be a surprise if top prospect Willy Adames even works his way into the picture later in the season; the 21-year-old has put up very good numbers in the minors and will now get his first taste of Triple-A. As noted earlier, the Rays’ lineup is looking heavy on left-handed bats, which is problematic since so many (Rasmus, Miller, Morrison, Kiermaier, Corey Dickerson and the switch-hitting Franklin) haven’t been very effective against left-handed pitching. It doesn’t bode well for an offense that already had a lot of trouble scoring runs in recent years, particularly since the right-handed hitting Steven Souza has yet to break out as the cornerstone player the Rays hope he can become. Norris posted solid hitting numbers from 2013-15 but badly scuffled last year. 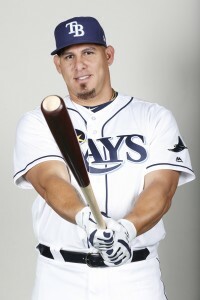 Longoria can’t carry the weight alone, so the Rays are certainly hoping Ramos can get back sooner rather than later. Archer and Odorizzi both had very large asking prices, so it isn’t surprising that Tampa Bay held onto both starters despite significant interest from the Rangers, Braves, Pirates, Astros, and others. The two righties join Cobb (a once-excellent starter who returned late last year from Tommy John surgery), highly-touted youngster Blake Snell and Matt Andriese in the rotation, with Erasmo Ramirez and Chase Whitley providing depth as swingmen out of the bullpen and De Leon on hand at Triple-A. There has been speculation that the Rays could still trade Ramirez or another pitcher before Opening Day, though in my opinion, another deal leaves Tampa a bit too short on capable rotation depth. Xavier Cedeno and youngster Jose Alvarado are the only lefty relievers on Tampa’s 40-man roster, so the Rays could still stand to add a southpaw or two in the bullpen unless Justin Marks, Ryan Yarbrough, or Chris Kirsch are called up from Triple-A to add some left-handed depth. Finally, Longoria is just about the furthest thing from a “question remaining” on the roster, but as usual, the offseason contained its share of rumors about whether or not the Rays would finally consider dealing their longtime star. The Rays reportedly have no plans or desire to move Longoria, and the third baseman has said many times that he wants to remain in Tampa Bay for the rest of his career. Longoria will gain control over his future when he gains no-trade protection as a 10-and-5 player in April 2018, so if the Rays ever did want to entertain the idea of a Longoria trade, they only have roughly 13 months to freely do so. De Leon seemed to be halfway out the door to the Twins for much of the winter, as he was the top trade chip offered by the Dodgers to Minnesota in trade talks involving Brian Dozier. Instead, De Leon ended up in a Rays uniform for another second baseman in Forsythe. The fact that such a notable prospect was so openly shopped could be seen as a red flag, though that could’ve just be the cost of doing business to acquire a top second baseman, plus the Dodgers have a deep enough farm system that they could afford to dangle such a promising young arm. Baseball America ranks De Leon 29th in its list of the game’s best 100 prospects, with the righty also drawing good marks in other top-100 rankings from MLB.com (#33), Baseball Prospectus (#38) and ESPN’s Keith Law (#73). Despite this high praise, there is still some concern among evaluators about whether De Leon has the durability to last in a rotation, as he has yet to pitch more than 114 1/3 innings in a single season. While De Leon made his MLB debut last season, he only pitched 17 innings for the Dodgers and was hit hard, allowing five homers and posting a 6.35 ERA in his brief stint in the Show. He may not quite be ready for the bigs yet, though he doesn’t have much less to prove in the minors given how he ripped through his first taste of Triple-A last year (2.61 ERA, 11.6 K/9, 5.55 K/BB rate in 86 1/3 innings). De Leon-for-Forsythe will be a fascinating trade to evaluate over the next several years, as since I noted earlier, it seems like a deal that a rebuilding team would make rather than a would-be postseason hopeful. That said, with Smyly and Matt Moore moved in separate deals within the last year, Tampa Bay may have felt this opportunity to add a high-end pitching prospect was too good to pass up. We’ll likely see De Leon in the majors sooner than later in 2017, either as a bullpen reinforcement (as the Rays have broken in many young arms) or even as a short-term rotation replacement. A more permanent job could open up, of course, if the Rays fall out of contention and consider trading Archer, Odorizzi and/or Cobb at the deadline. Much is riding on Ramos coming back in good form, and it would also be a boon for the Rays if some of their lefty bats could provide at least passable offense against southpaw pitching. In the bigger picture, the Rays would certainly have a better sense of their future direction if players like Souza, Duffy, Dickerson or Miller firmly established themselves as reliable everyday pieces. Tampa acquired all four in significant trades and, aside from Miller’s power surge last year, the Rays are still waiting to see exactly what they have in the quartet. Tampa Bay will spend a projected $65.46MM on player salaries this season, a minor step down from last year’s Opening Day number ($66.68MM) and once again one of the lowest payrolls of any club in baseball. With this financial reality in place until the Rays can finally get a new ballpark, cost-cutting moves like trading Forsythe and Smyly are par for the course in order for the team to budget for even modest signings like Ramos or Rasmus. The last time the team went “all-in” by their standards was in the 2013-14 offseason, a move that backfired on the Rays after they suffered the first of three consecutive losing seasons. It could be argued that the Rays should have just bit the bullet by trading Archer or Odorizzi to embark on a full-blown rebuild, though it’s hard to blame the team for demanding full value for either of their most valuable pitchers. There’s also enough talent and potential on this roster for Silverman, Neander, and Bloom to quite reasonably believe that the Rays can get back to winning baseball. If the Rays aren’t in contention at the deadline, however, they could be the most sought-after trade partner in baseball. Mixed bag of an offseason. Their bullpen could be good if they pass on the veteran guys they brought in and just take the crowded AAA rotation and use a few as relievers instead. Shultz, Pruitt, Marks, etc. are better bets than Diaz or Tolleson. Both of those guys are fine to stash in AAA as depth, but you can’t be a contender and rely on that; almost zero upside. Brad Miller was hitting great when he played SS so that comment about the move to first causing his bat to breakout is false! he moves to first at the end of the season. Yeah, not sure where that came from either. He also was settling in defensively at SS before the move too; he was terrible both at the plate and up the middle in April. yeah, his productivity was about the same. His BA went down at 1B, but his ISO went up. If you care the most about power, then the switch arguably helped him. Yanks and Rays trying work on a deal where Yanks send Rob Refsnyder to Rays for who knows what but mainly to free up a 40 man roster spot so I’m thinking it won’t be anything significant coming from Rays if the rumor is accurate which was published in NY Post. A very optimistic preview about the Rays, there’s no where to go but up after nearing losing 100 games last year. Franchise has been in a downward spiral since the 2013 playoff year, and fan support continues to be a major problem. Rays ownership had a setback recently with their preferred sites rejected for a new stadium in the Tampa area. Like the fact the Rays were aggressive and creative in the offseason, but so many things have to go right for Tampa Bay to improve enough to contend for the first time since 2013. Will all the new pieces work out? Can Chris Archer rebound from a subpar 2016? The infield is in flux, and the bullpen is questionable. Looks like a 73 win club..
I’m very happy to be a Durham Bulls season ticket holder this season. That team should be loaded!